Save up to 6% in Long Island broker commission by listing For Sale by Owner in Nassau, Suffolk or Queens County with a Long Island Flat Fee MLS Listing Package. Seller closing costs are high enough, so why add another 6% to your bill by hiring a full-service listing agent when you can sell on your own? 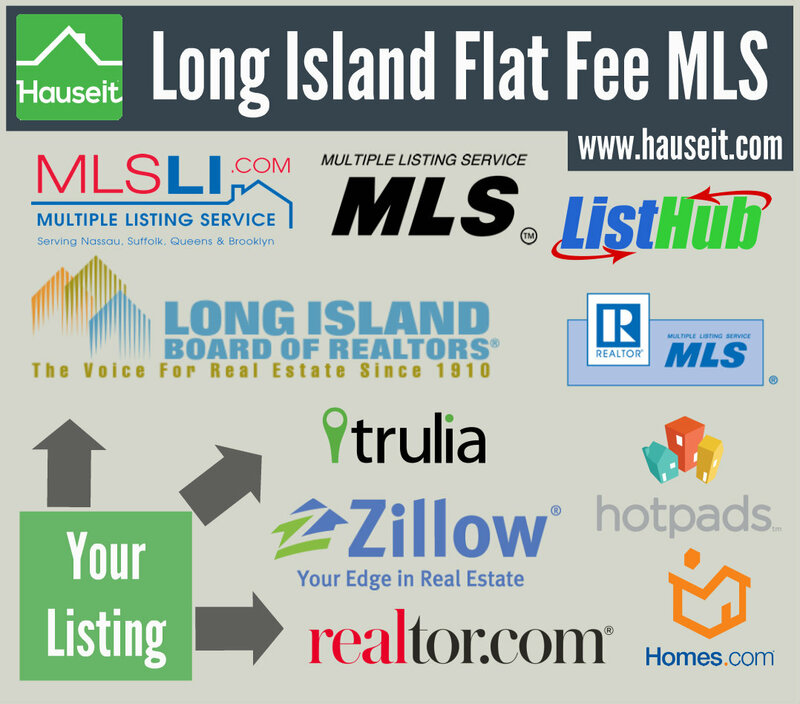 Hauseit’s Long Island Flat Fee MLS service lists your home on the Long Island Board of Realtor’s MLS database (MLS LI), Zillow, Realtor.com, Trulia, StreetEasy, HotPads, Brownstoner and dozens more websites for 0% seller’s broker commission. Our Long Island focused Flat Fee MLS (MLS LI) listing service uses the same listing syndication technology as traditional, full-service agents who charge 6% in commission. Your FSBO listing will receive the same marketing exposure and access to both unrepresented and represented buyers as if you had hired and paid 6% to a traditional listing agent. If you are selling in the greater NYC area, Hauseit offers you the ability to list on both Long Island MLS as well as REBNY’s RLS Broker Database at the same time. This unique dual coverage model ensures that your listing will be accessible to buyer’s agents who are members of either the Long Island Board of Realtors or the Real Estate Board of New York, which is the largest real estate trade group in the greater NYC area. Save up to 6% in Long Island broker commission by listing For Sale by Owner in Nassau, Suffolk or Queens County. Seller closing costs are high enough, so why add another 6% to your bill by hiring a full-service listing agent when you can sell on your own? Hauseit’s Long Island Flat Fee MLS service lists your home on the Long Island Board of Realtor’s MLS database (MLS LI), StreetEasy, Zillow, Realtor.com, Trulia, Brownstoner and dozens more websites for 0% seller’s broker commission. Why Sell For Sale by Owner in Long Island? Save thousands in commission by listing with a full-service, LIBOR member listing agent in Long Island for just 1% commission. Why should you have to pay 6% just because you don’t have the time or motivation to sell For Sale by Owner? Our 1% full service listing option is identical in every way to what you’d expect if you paid 6%. The only difference is the price. Why overpay? Seller closing costs in Long Island are high enough, so why give away another 6% of your sale proceeds by hiring a full-service listing agent? Real Estate commissions in Long Island continue to be sky high despite the advancement of technology and the greater transparency and buyer empowerment it facilitates. As a seller, it’s never been easier to leverage technology in order to market your home with the same effectiveness as a traditional agent but for a fraction of the price. Your typical full-service brokerage in Long Island will offer you countless excuses for why they are justified in charging you the full 6% commission. They will claim that their marketing is top notch and that they have a list of buyers already lined up to purchase your property. After speaking with a traditional agent, you will be led to believe that there is no other way for your property to be comprehensively marketed aside from hiring a full-service listing agent. What these full-commission brokerages fail to mention is that you can achieve the same marketing exposure by using Hauseit’s Long Island Flat Fee MLS listing package. Our Long Island Flat-Fee MLS listing service uses the same listing syndication technology as traditional, full-service agents, which means that your listing receives the same marketing exposure as if you had hired and paid 6% to a traditional listing agent. Your listing will be comprehensively marketed on MLSLI (Long Island MLS) as well as dozens of real estate websites, ensuring that you have full exposure to both represented and unrepresented buyers. There’s a reason why we’ve listed $300+ million of real estate in New York. Our service is overwhelmingly effective, and the proven results our sellers have experienced speak louder than the scare tactics and lies of brokers. As a FSBO seller on Long Island, there is no greater priority than ensuring that your listing is correctly marketed to both unrepresented and represented buyers. Many unsuspecting FSBO sellers fail because they purchase a generic national ‘Flat Fee MLS’ package which is not designed specifically for Long Island. Choosing the wrong Flat Fee MLS service can severely curtail the exposure received by your listing and decrease your chances of selling for the highest price or selling at all. Hauseit’s Long Island Flat Fee MLS package is specifically designed for FSBO sellers in Long Island. We list your home on the official MLS of the Long Island Board of Realtors (LIBOR), which is called MLS LI. This shared database of listings is used by over 26,000 fellow LIBOR Realtors and over 2,280 separate real estate offices on Long Island. Being listed on MLS LI is the single most effective marketing method for exposing your listing to the buyer’s agents who represent over 75% of buyers. Your home will also be listed on popular consumer websites such as Zillow, Realtor.com, Trulia, StreetEasy, HotPads and dozens more leading real estate websites. Because we use the same listing syndication technology as full-service brokers, our Long Island Flat Fee MLS package offers your listing the exact same exposure as if you’d hired a full-service Long Island listing agent and paid 6% in commission. Over 75% of buyers are represented by buyer’s agents in Long Island. If you fail to effectively co-broke with buyer’s brokers, it means that you are marketing your listing to just 25% of potential buyers. Restricting the number of buyers who are looking at your listing will result in less traffic, fewer offers and ultimately a lower sale price if you happen to sell at all. Buyer’s agents habitually avoid FSBO listings because they are inherently riskier. When there are thousands of broker-listed properties with documented commissions posted in MLS LI (MLS Long Island), why would a buyer’s agent send his or her buyer to a FSBO listing and risk being paid less commission or none at all? Our Long Island Flat Fee MLS package solves this fundamental trust issue by advertising your listing in MLS LI for all 26,000 member agents to see. Over 26,000 LIBOR agents use MLS LI to search for and directly send listings to buyers. By being listed on the Long Island MLS, your listing will therefore receive unparalleled exposure to virtually every single agent on Long Island. Buyer’s agents habitually avoid FSBO listings because they are inherently riskier. When there are thousands of broker-listed properties with documented commissions posted in MLS LI (MLS Long Island), why would a buyer’s agent send his or her buyer to a FSBO listing and risk being paid less commission or none at all? Our Long Island Flat Fee MLS package solves this fundamental trust issue by advertising your listing inMLS LI for all 26,000 member agents to see. Hauseit’s Long Island Flat Fee MLS listing service allows you to effectively market to the 75% of buyers who are represented by buyer’s agents on Long Island. What is a Long Island Flat Fee MLS Listing? Why should I list my property on MLS Long Island (MLS LI)? What is the Long Island Board of Realtors (LIBOR)? What is MLSLI (MLS LI)? What areas of Long Island do you service? What do I do when I accept an offer, enter contract or close on my sale? Do you offer a lockbox and a for sale sign? A Long Island Flat Fee MLS Listing is a easy and effective way for you to market your home to thousands of buyer’s agents without having to hire a listing agent. Because roughly 75% of buyers in Long Island are represented by buyer’s agents (buyer’s brokers), its essential for you to advertise your home to agents if you are looking for the best possible sale outcome. Using a Long Island Flat Fee MLS Listing service means that your property will be advertised simultaneously to all 26,000 members of the Long Island Board of Realtors. Your listing will be placed into MLSLI (Multiple Listing Service of Long Island), which is a database of over 25,000 listings currently for sale across Long Island. Access to MLSLI (Long Island MLS) is member-only, and it’s the system that over 26,000 buyer’s agents in Long Island use to search for and send suitable listings to their buyer clients. According to the National Association of Realtors, an MLS is a “private offer of cooperation and compensation by listing brokers to other real estate brokers.” In short, the Multiple Listing Service (MLS) is a shared database of listings accessible only by fellow brokers who are members of the MLS. When a property is listed on MLS, it means that any fellow member of the MLS is contractually eligible to earn a commission if he/she finds a buyer for the property. This gives buyer agents the comfort and motivation to market your home to their clients. As a seller in Long Island, the only way to have your property listed on the local MLS (MLSLI) is to hire a listing agent who is a member of the MLS system. Using a Long Island Flat Fee MLS Listing enables you to list your home on MLSLI (MLS Long Island) for a one-time, flat fee as opposed to hiring a traditional listing agent and paying 6% in commission. There are currently over 800 different MLS systems, so it’s critical that you choose the right MLS before listing your home. Fortunately, the choice in Long Island is easy. MLSLI (Multiple Listing Service Long Island) offers comprehensive coverage throughout Long Island. Listing your property on the MLS ensures that your property receives the full attention of the 75% of buyers who are represented by buyer’s agents. As a FSBO seller, failing to list on the MLS means that the vast majority of buyer’s agents won’t ever see your listing. In Long Island, over 2,280 real estate offices use the MLSLI search database when looking for suitable listings to send buyers. Your listing will not appear here unless you use a Long Island Flat Fee MLS Listing. For the handful of buyer brokers that do see your listing, most of them will ignore your listing. FSBO sellers are notorious for trying to re-negotiate commissions or trying to weasel out of buyer agent compensation altogether. After all, why would a buyer’s agent risk his/her commission by sending a buyer to a FSBO listing when there are dozens of traditional, MLS-listed properties which offer guaranteed commissions? Even if the buyer agent decided to show your property, he/she would have to waste time by making you sign a commission agreement. This makes your listing uncompetitive relative to every single listing on MLSLI, which already have contractual commissions on offer to buyer’s agents. As of 2017, LIBOR has over 26,000 active members. There are approximately 7,000 members in Queens County, 9,000 members in Nassau County, and 7,000 members in Suffolk County. Over 50% of New York State’s realtors, which number approximately 55,000, are members of the Long Island Board of Realtors. The Multiple Listing Service of Long Island, Inc. (MLSLI) is a computerized network of 2,280 real estate offices located in Nassau, Suffolk, Queens and Brooklyn. The Multiple Listing Service of Long Island, Inc. is a subsidiary of the Long Island Board of Realtors, Inc. (LIBOR). MLSLI is used by over 26,000 agents to search for and send suitable listings to buyer clients. At any given time there are approximately 25,000 listings on MLSLI (MLS LI). Over 75% of buyers are represented by buyer’s agents who exclusively use MLSLI to screen inventory and send relevant properties to buyer clients. If you list FSBO on Long Island and fail to list on MLSLI, it effectively means that you have excluded your listing from virtually every single buyer’s agent on Long Island. This means that you’ve restricted your pool of buyers by 75% or more, which materially decreases your likelihood of selling for the highest price or selling at all. Our Long Island Flat Fee MLS Listing Service is available across all of Long Island including Nassau County, Suffolk County and Queens County. If you are selling in Queens, we can also place your listing in REBNY’s (Real Estate Board of New York) RLS broker database which is the dominant broker database throughout New York City. Being listed on both MLSLI and RLS will offer your listing exposure to over 26,000 LIBOR and 17,000 REBNY buyer agents, respectively. In each instance when you’ve accepted an offer, signed a contract and closed, please let us know as soon as possible by submitting an update here. MLSLI (MLS LI) requires that status updates be relayed same-day, and they issue automatic fines to anyone who does not provide updates in a timely manner. To avoid these MLS fines being passed onto you, we kindly ask that you keep us informed on the progress of your sale. Yes, we offer both lock boxes and for sale signs. Once you’ve submitted your FSBO listing details, please contact us to inquire about these additional offerings.